PATHOGENS is currently in editing and once I’m done I’ll need your help. This is by far my most ambitious book, featuring six playable characters each with their own point of view and unique storyline. Which is why, for the first time ever, I’m opening a work-in-progress for early reads and feedback. I’ve hinted at “something big” in my monthly newsletters for a while now, and this is it. The official request will come in a newsletter later this week, so if you haven’t signed up for the mailer yet, make sure you do. Tell me, how did being devoured by the ravenous undead make you feel? Interested? Sign up for that mailing list! Not the feedback type but still want to follow along? Sign-the-eff-up already! No, I’m not going to give you the whole book. Frankly, that would leave me constantly sending “Are you done yet? Did you hate it? Is that why it’s taking so long?” follow-up emails and nobody wants that. Instead, I’m going to ask for your top-three characters, so that way I can spread the feedback love around. Here’s a sneak-peek of the book’s first choice. Who would you choose? Unlike other Click Your Poison™ books, this is the first one where you don’t “play” as yourself. 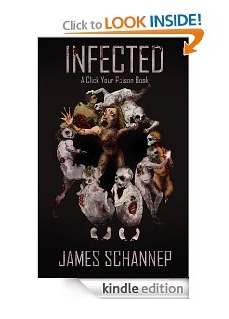 Instead, you can choose a character and see how that person survived the initial outbreak from their own perspective. Think of this page as your “character-select screen” in this gamebook. Each of these characters first appeared in INFECTED, but you don’t need to have that book memorized (or even have read it, truth be told), to enjoy PATHOGENS. Instead, pick a persona and learn their story as only one who experienced it truly can. But beware—since these characters appear in another book, if you take the wrong path and end up bitten, mangled, or dead, you’ll rip the very fabric of the space/time continuum and your adventure will be over. Good luck! Technical Sergeant Robert Sims, National Guardsman and electrician in the greatest Air Force in the goddamned world. Divorced, no kids, fourteen years of service given to your nation thus far. You’re a “Prepper” (a dedicated survivalist), and you’ve been looking forward to the zombie apocalypse for as long as you can remember. Your unit was mobilized and now you find yourself at the tip of the spear. When it comes to idioms you’re not the smartest crayon in the box, but you’re an electrical genius. Kaeden Cooper, known as “Kay” to your friends. Daughter of a NASCAR driver who turned to the bottle and lost his shot at stardom. You’ve since done your fair share of racing on the motorbike circuit, but it’s still very much a man’s world, and no one wanted to give you sponsorship unless you posed by the bike in a bikini. Instead, you turn wrenches for a living, working for the weekend until you can ride again. Little do you know that this shift under the hood will be your last. Soon the world will learn it’s those who know how to change their own oil that will survive. Smart, cute, spunky redhead. 17-year-old high school student. Your father is a combat-veteran Marine and you work weekends at the family-owned shooting range. Sarah is your real name and truth be told, you’re more interested in boys and music than you are bug-out-bags and MREs, but you play along for dad’s sake. Ever since mom died he’s had a hard time and he’s not the type to get a pedicure so for quality time you learn about pyrotechnics. Unfortunately, Sarah’s world is about to end and you’ll have to fully embrace his training to become the “Rosie the Riveter” of the apocalyptic wasteland. Lucas Tesshu, middle aged man known for being as serene as a stone in the stream. As a child of Japanese immigrants, you’ve lived much of your life as an outsider, making solitude a revered mentor and friend. As a Kendo instructor and master of swordplay, you’re more than capable of defending yourself, but as a disciple of Bushido, you are committed to helping those in need. So the question becomes: Can a man unable to leave someone for dead still survive the Zombie Apocalypse? Poor as dirt, good ole southern boy. Thin as a rail, and yeah, the nickname is ironic. Known to the State as inmate #: 080620-06. They say money doesn’t grow on trees, but you can cook some up in your kitchen using a few household ingredients as fertilizer. Like literal fertilizer, for one. But you’re over that now, clean, back on the straight and narrow, and ready to be a productive member of society once you get released from the Big House. Which is about to come early, courtesy of the Apocalypse. Thanks for reading! Excited? Apathetic? Fun summer plans? Your new story sounds great. It must be part of the cycle of IF writers because my latest work has characters too. Aww, really? I always think I’m doing something unique. Okay…just you and me, then. Deal? Hello, James Schannep! I’m not sure if I’m supposed to click on the survivors (nothing happens when I do), but in case you’re taking votes, I picked Cooper, Tyberius and Lucas. P.S. Apart from zombie stories, space/time continuum references also make my day! Thanks, Maria! These links are “dead” links here (they go to spots in the book). My monthly newsletter will go out later this week with the “official” request, so if you could please reply to that email when it comes out that would be fantastic. … checking my email.. again.. I picked Tyberius, Rosie, and Lucas. Thanks, Ken! Make sure you reply to Thursday’s email and I’ll get you the stories as soon as I can. Hi, James. Sounds exciting! I chose Tyberius, Rosie and I’m torn between Sims and Lucas. If pushed, I’d choose Sims. I’m already on your mailing list, so unless gremlins get into the act, I’ll get your newsletter. Glad to hear it! I’ve got a gremlin contingency plan, should the need arise. I picked Peppermint, Steve, and Angie. Then realized they weren’t in this story. I am shamed. I’ll hook up with you soon, buddy. I’ll sign up through the mailer. The next book will have a Peppermint character, just for you. Thanks! Looking forward to your thoughts.